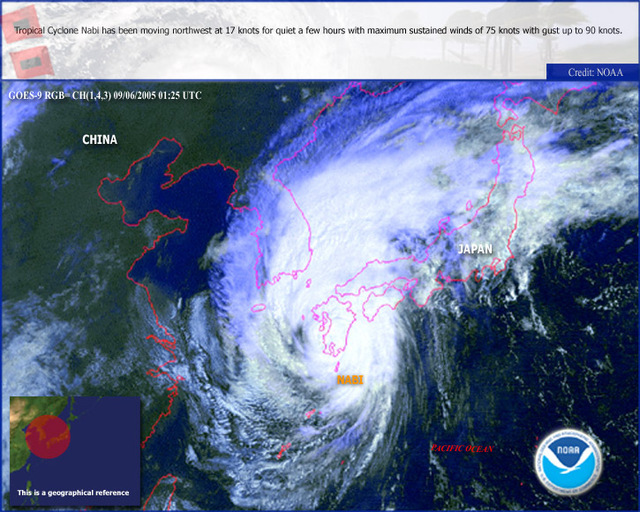 SEOUL, Sept. 6 (Xinhuanet) -- South Korean southern and eastern provinces suffered damage from Typhoon Nabi on Tuesday. Most ferry services and 133 domestic flights between Seoul and provincial cities were canceled due to strong wind and heavy rain. Typhoon Nabi, the 14th storm of the season, was expected to go ashore on the densely populated southern Japanese island of Kyushuin the afternoon, said (South) Korean Meteorological Administration (KMA). A total of 29 international flights from South Korean cities to Japanese cities were also called off. TOKYO (AP) — Typhoon Nabi lashed southern Japan on Tuesday, forcing tens of thousands to evacuate as the government dispatched troops to fortify defenses against the waves and flooding. At least 15 people were injured and three reported missing. With winds of up to 89 mph, the storm churned near the coastal city of Kushikino on Japan's southernmost main island of Kyushu, Japan's Meteorological Agency said.